Perth—home to some of the most attractive sights known to man. From the people and the beaches, to the jacaranda-lined streets and restaurants with stunning interiors. Here’s a selection of the most beautiful restaurants in town because, let’s be real, we all judge a book by its cover! If you’ve seen even just one picture of the interiors at Island Market you’ll understand what we’re talking about here. The bright white and pastel pink with neon signs and lofty white ceilings may sound kitsch but they work a treat. The restaurant is modern and stylish but its beachside location means it still feels fun and relaxing. It is everything beachside dining in Perth should be. With a name like Henry Summer, it’s not surprising that this Northbridge bar is one of the most beautiful spots to sit and enjoy a bite and a drink in the sun. From the jungle vibes to the cutesy green chairs and pastel pink bar stools, there aren’t many places this freaking gorgeous around. Every single area of Market Grounds has been styled perfectly, including the dining area. Think natural light, beautiful booths, loads of greenery and cute blue stools. The bombe Alaska is also pretty beautiful, just saying. We love New Normal's open kitchen and the painted brick walls, but what we’re really lusting over is the handmade ceramic plates from local company Winterwares. Don’t forget to check out the rooftop bar above the restaurant. A beautiful view and a beautiful interior, The Shorehouse really does have it all. Wooden floorboards, comfy booths in soothing tones and pretty greenery. We could spend all day here. Odyssea, we dig you big time, especially your caramel-toned pendant lights. Everything from your chairs and tables to your wooden rafters and metallic walls is a picture of perfection. The views are just the icing on the cake. Breakfast and lunch at Post in the State Buildings is a glorious experience—with a beautiful tree smack bang in the middle, white and black accents and a comfy grey couch wrapping around one side, you will never want to leave. Top that with delicious, good-for-you food—it's no wonder we can't get enough of this place. 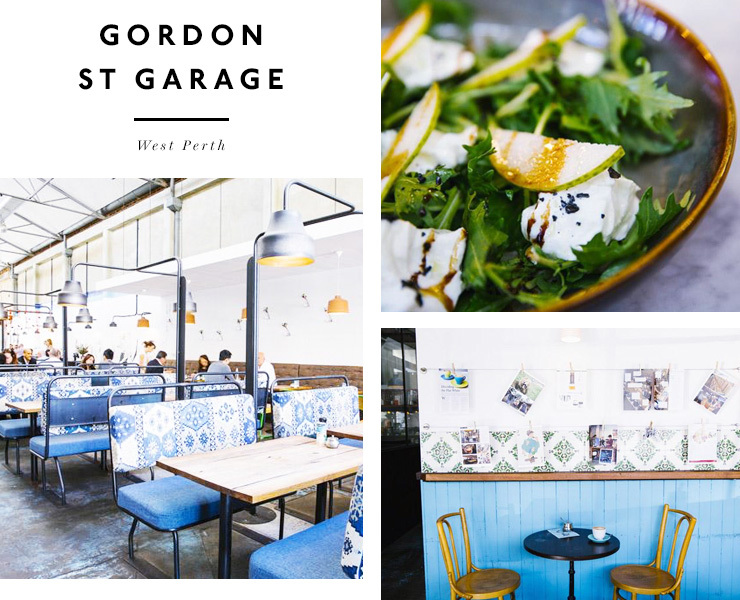 One of the first warehouse-style restaurants in Perth, Gordon St Garage still holds a special place in our hearts with their unfinished concrete floors, high ceilings, exposed beams and some of the prettiest booths you’ll ever lay eyes on. There are high ceilings, exposed brick walls lined with wine (wine always makes things more beautiful), long tables and some seriously beautiful lighting going on in this giant warehouse-style building. Bread In Common’s food is also pretty dang tasty so you’ll never be disappointed! Think loads of natural light, polished concrete floors and a beautiful bar covered in black and white tiles (not to mention all the tequila on show) and you're on the right track. The team at La Vida Urbana designed the space themselves and we think they've done a mighty fine job! Long Chim. Where do we even start? Tucked under the State Buildings, David Thompson’s delish Thai street food restaurant is b-e-a-utiful. Exposed brick, street-art-style artwork, concrete and rustic wooden chairs—their interior designer should be very pleased with themselves! 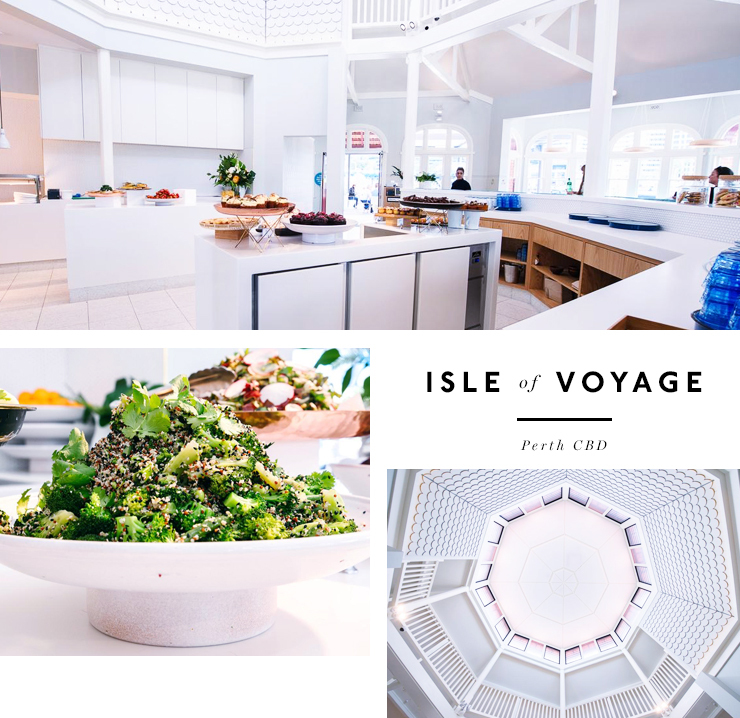 Isle Of Voyage’s interiors game is strong. It’s not just the views that are spectacular, but also their high ceilings with big arched windows, white walls, wooden floorboards and tropical green furnishings. Can we move in please? Dark and moody with art-deco features, Il Lido’s wall filled with wine bottles is a beautiful sight. That, paired with delish pasta, lovely long communal tables and the view of the beach, means dining here is always a wonderful experience. The banoffee bombe Alaska isn’t the only incredible thing to look at Bib & Tucker, their interior, exterior and view are pretty darn special too. It’s enough to convince you to move to North Freo. Once an old bus garage, North Fremantle cafe Propeller has been transformed into one of the most colourful and vibrant eateries going around. Cool vibes and friendly staff make this a super fun place to hang out. Little Way has some of the yummiest food going around, but it’s also one of Perth’s most beautiful restaurants. Located in a lovely heritage building in Nedlands, they’ve got some serious #doorporn going on, an amazing courtyard and loads of leafy green goodness. Home to possibly the tallest frangipani tree in all of Perth (how the heck did it get so big? ), a visit to Kitsch always feels like you’re on holiday. With loads of lanterns hanging overhead, Kitsch is best enjoyed on balmy nights. Looking for more pretty things? Here are some of the most stunning places in WA that you probably don’t know about!